To get to Woods Cove in Laguna Beach turn south at Diamond street from PCH. If parking is particularly bad you can back out to PCH and then turn at Moss street. The parking will be on Ocean which is a one way street. Diamond street is several miles south of Broadway street and the main beach. There are NO signal lights at either of these streets and the signs are easy to miss! Moss street is probably the most pronounced with large letters "MOSS POINT" on a brick wall (see picture featured on Moss Street). 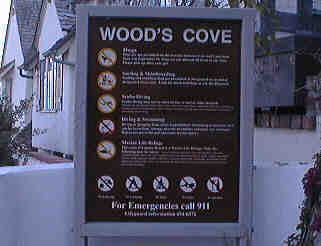 The entrance to Woods cove is just past Diamond street on the south side of ocean. Woods cove is completely in a residential area and you enter the beach from between two houses. The parking at Woods cove is on Ocean street. There are very few parking places and if you want to dive at Woods cove either get there very early and/or be very lucky! 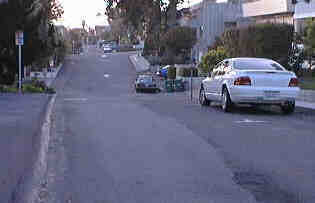 Ocean street is a one way street and the parking is only on the north side of the street. The south side of the street only has private driveways (please don't park in someone's driveway). Please remember that this is a residential area and be courteous and discrete. Beach access at Woods cove is available from a stairway at the street level down to the secluded cove. There are houses on each side of the staircase and a beautiful garden area past the first steps. There are a lot of steps to the beach and the stairs are steep so be careful ascending and descending and take your time when loaded with dive gear. 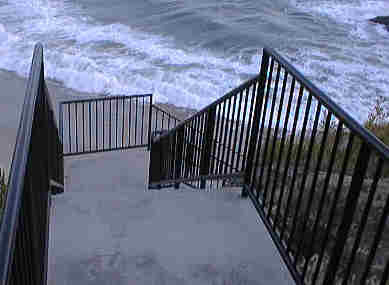 Sometimes the last step off of the stairs is quite a drop off when the sand gets washed away so be ready! During high tide the entire beach gets wet so don't leave anything in the sand (it may not be there when you get back!). 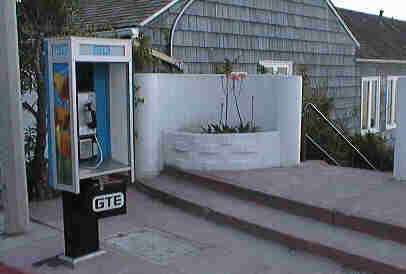 The only facilities available at Woods cove is the telephone at the top of the staircase. This picture is an evening picture of Woods cove. There are two areas to dive in, pictured is the one on the west side. The bottom drops off sharply and can be covered with rocks and shells. There are several rocky reef areas that are great to explore. Dividing the two sides of Woods cove is a large rock (on the left of the picture). 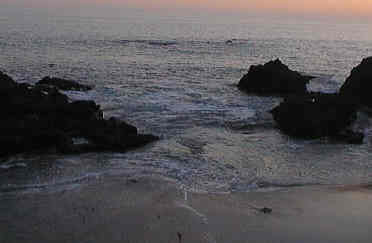 Woods cove has some of the best diving in Laguna Beach. Woods is not as sheltered from the waves as some of the other coves and can get a bit rough. When you find the weather and water agreeable this is an area that you will want to spend several days exploring.